Bump. Just for fun, I'm giving away a "UMass Football Blog" ball cap to the person who e-mails me the closest guess to the score of the UMass-Kansas State game. My e-mail is available in the "About me" section of the blog. It's free and I'll pay the shipping. I'll erase everyone's e-mail after the contest. Time is getting short! WWLP has another story on Kyle Havens being named starting QB. They have a video interview link as well. Matty Vautour adds another article this morning . As mentioned in the comments, the Worcester Telegram reports Anthony Monette will start at defensive end. Good for Anthony; he's put in his time and it's great when a senior gets to start. UPDATE II: The UMass website has a transcript of Coach Morris's weekly CAA teleconference call. UPDATE III: Matty Vautour reports that UMass has released a depth chart for Kansas State. He has an annotated version up. A couple of surprises. UPDATE IV: Stuff is happening fast and furious. UMass game notes for Kansas State (html). Game notes (pdf). 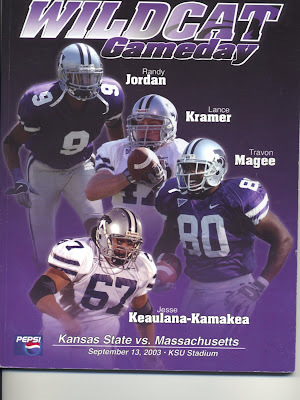 UPDATE V: Kansas State's game notes for UMass (pdf). James Ihedigbo gets praise from the NY Star Ledger. Coach Brown gets more praise in his re-working the Terps defense. A Manhattan sports columnist thinks the Cats will win seven games this year. Another says that Kansas State will feature the pass more in 2009. The Wildcats will have a lot of unknowns this year. With a new HC, new offensive and defensive coordinators, a totally new linebacker corps and two new DB's, UMass has the same feeling. We're not the only FCS/I-AA team playing a Big-12 opponent this week. NDSU plays Iowa State this Thursday. Every sports blogger on the planet has a link about problems with Michigan's practice policies. Since we play the Wolverines next year, I'll add it too. Click on the image and Blogger displays a larger view. Since the first post I worked on the image a little. I cropped the image down and did an auto levels. Think it works a little better. The UMass athletic site has a sizable article on Coach Morris' announcement that Kyle Havens will be the starting QB at Kansas State. The Springfield Republican has a story here. The UMass website has a podcast of the press conference with both Coach Morris and Havens commenting on the selection (mp3). Back on August 18th (Media Day), the Springfield Republican posted a video interview with Havens here. Matty Vautour has a short article asking if Haven will have Todd Bankhead or Richard Lucero level of success. Lucero had good success on the field. In 2000 he went 140/235 2065 .596 17 TD 16 INT 143.6 EFF (higher than either of Bankhead's EFF's). His 8.8 yards/attempt is still #3 in UMass single season records. Lucero's 17 TD's that year tied him for 8th in single season along with Todd Bankhead and Peil Pennington. However, he got in Whipple's doghouse early and often by missing QB meetings and general poor discipline. By the time Lucero got into trouble with the Amherst police, he was already off the team. Bump. Just for fun, I'm giving away a "UMass Football Blog" ball cap to the person who e-mails me the closest guess to the score of the UMass-Kansas State game. My e-mail is available in the "About me" section of the blog. It's free and I'll pay the shipping. I'll erase everyone's e-mail after the contest. Kevin Tresolini of Delaware On LIne takes a look at the 2009 Delaware Hens and predicts 7-4 or 8-3. The full CSN FCS 2009 Handbook (99 pages) is available as a pdf download here. A former Kansas (as in Jay Hawk football) blogger goes legit and is assigned to be Kansas State beat writer. Wildcat fans are not amused. The CAA will air a 2009 preview show on Aug 31st and Sept 2nd. It will be available on-line at ESPN 950 AM Radio. Brett Kahn of the Sports Network takes a look at FCS independents including soon-to-be-CAA member Old Dominion. If you missed it, the 2009 College football season opened last night as FCS/I-AA team Indiana State played NAIA Quincy. The Sycamores lost in overtime 26-20. Right away that should be the upset of the season. Indiana State has only won four games in the last five years, so they have to have reduced scholarships and support. Still, they had 16 returning starters and transfers from Wyoming and Kentucky. An NAIA team beating a Div I team is unusual to say the least. BTW, the Trees next game is against Louisville, who beat Kansas State last year. New Rhode Island HC Joe Trainer promises a "Dramatically better Ram team" this year. The CSN's Chuck Burton makes 27 fearless predictions for the 2009 season. One of them was Indiana State over the Quincy 48-0. Multiple articles about K-State football in the last 24 hours. Read 'em here. Kansas State supplies tickets to the family of Fort Riley soldier Luke McGuire. Sargent McGuire is currently in his fourth deployment to Iraq. Jeremy Cain's Jacksonville Jags bio here. Coach Morris say he may not pick a starting QB until game time. More comment by UMass beat writer Matty Vautour here. The Springfield Republican has an article on UMass RB Tony Nelson. UMass has added to the roster Brandon Levengood a 6-0 185 pd kicker from Lebanon, PA.
Levengood's Rivals page here (with video highlights). College Sporting News' Kent Schmidt takes a look at FCS teams in the west. UMass is ranked #17 in the Sports Network preseason poll. Kansas State is looking at maintaining its special teams supremacy . Boston College is having QB problems also. UPDATE: Matty Vautour reports no starting QB named yet. The Locomotives Wikipedia page is here. The Locomotives will be coached by former Giants HC Jim Fassel and will have a bunch of former NFL stars on the roster. Brett Kahn of The Sports Network previews the Northeast Conference. He picks 2009 UMass foe Albany to win their third straight league title. Current NY Giants coach Tom Coughlin speaks to the Albany players at their training camp. Good speech. We've already met Fordham QB John Skelton in the 2007 playoffs. Now the NFL is taking a look. Note that I found this link over on the always interesting Draft Daddy site. 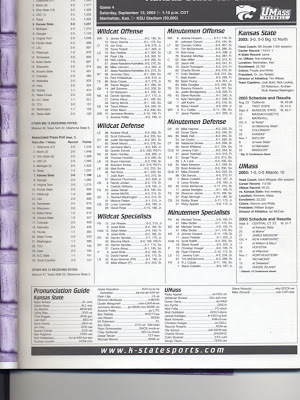 The FCS 2009 College Football Handbook is a work in progress and is up to a 35 page download here (pdf). Kansas State does not have a starting QB yet either. The front runner is Carson Coffman. 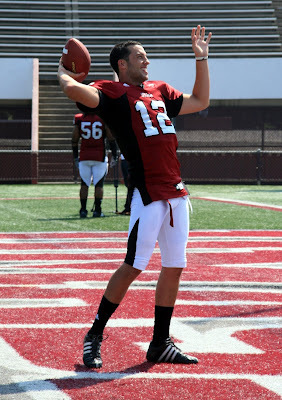 I believe UMass is supposed to name a starting QB after tomorrow's scrimmage. 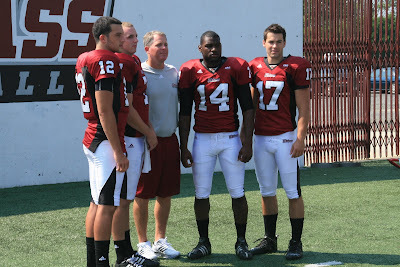 I forgot to mention that I have about 15 images from the UMass Media Day in a Picassa web album here. There's also a link in the sidebar under the "2009 UMass Images" heading. UMass was ranked #18 the FCS Pre-season Coaches poll. The Minutemen also received one #1 vote. You remember the on-going soap opera about the state of Delaware allowing sports betting (See the last item in this blog post). The proposed sports betting would include betting on College football games. The NCAA has threatened to ban all playoff games in the state of Delaware. Yesterday the Third Circuit Court of Appeals absolutely blew the state of Delaware out of the water by ruling the State's plan was contrary to Federal Law and could not proceed. Matt Vautour has an article on Chris Zardas. The Blog thinks Zardas, when all his body parts are working, is a heckofa player. Hope he stays healthy this year and makes an impact for the Minutemen. Matt also says Jonathan Hernandez and Cedric Gonnet are likely to be the 2nd and third string TBs for UMass in 2009. I watched the Jets-Ravens game last night. James Ihedigbo had an interception on a play that produced three different penalties. The refs ruled offsetting fouls, so James did not get credit for the INT. The game stats listed Matt Lawrence as having one carry, but I must have missed it. Keron Williams is playing for the Montreal Alouettes. His Alouettes bio here. His Wikipedia page here. Anyone know what an "Alouette" is? Keepers College Football Ratings and Prediction has moved to a new site. Montana plans to bid for the 2010 FCS National Championship game. Now that would be fun to attend. The Springfield Republican has an article on Bob McLaughlin following in his father's footsteps. BTW, in 1978 Joe McLaughlin led the Minutemen with 76 UT 66 AT 142 TT. Bob, playing as a sophomore down lineman in 2008 had 13 UT 7 AT 20 TT 0.5-2 sacks 1-2 TFL. TRIVIA Contest: Joe led the Minutemen in tackles in 1978. Jeromy Miles led the 2008 UMass team with 104 TT. Question: over those past 30 years, how many leading tacklers WERE NOT linebackers? Answer at the end of this blog post. Warren Wilson gets a mention in Eagle Tribune. More than 1,500 people showed up at the Kansas State Fan Appreciation day. Bill Synder wowed the Cats faithful. The CSN website has a full list of FCS interdivision games for 2009 here. The first installment of the CSN 2009 Yearbook is available here. My season tickets arrived Saturday. That's the 33rd consecutive year in Section 6, Row I. Take a moment and e-mail me a guess of the score of the UMass-Kansas State game and be entered into the UMass Football Blog Hat give-a-way contest. E-mail address in the "About Me" section of the blog. Bump. I'm giving away a very nice Maroon & White "UMass Football Blog" ball cap to the person who e-mails me the closest guess of the UMass Kansas State game. It's free and I'll pay the shipping. The contest is just for fun (I have an extra hat). I'll delete all the e-mail addresses after the game. Participation has been light so far. A decent guess has a good chance of winning. WWLP has a short article on the UMass defense and a video interview with Jeromy Miles here. Matt Vautour has an article on the position battles in training camp. He also has a blog post on former UMass star James Ihidogbo in the Jets training camp. Seven UMass players are on the College Sporting News 2009 preseason All-America teams. That's tied for second highest number of players named in the entire FCS. Cal Poly gets a really nice new scoreboard. With the recession, it'll be a while before McGuirk's scoreboard is updated. Remember my blog post of August 13th? I had a mention and link about Rhode Island's Joe Casey returning from a devastating compound leg fracture. Casey dislocated his ankle in training camp and his college career may be over. Condolences from the UMass Football nation to Joe. Hope he recovers. Another member of the Blog's vast reporting corps let me know that there is a new version of the 2009 Fall roster up. Jarad Chivers (now wearing #66) was listed as a Senior last year, but must have been granted another year of eligibility. Jesse Julmiste (wearing #16) a 5-9 165 pd WR from Dodge City JUCO. He ran a blazing 4.36 40 in a 2006 Nike training camp. Julmiste was third-team All-Broward County in 2006 (pdf). His Scout.com page here. Woody Carter IV (wearing #19) a 6-1 175 pd TB from Dean JUCO. I've blogged about Carter before. Nick Jablonski (wearing #80), a 6-5 220 pd TE. Enterprise All-Scholastic. Scored the winning TD in the 2009 Shriners Classic. UMass has a new contract with ESPN Radio to increase coverage in the Boston area. Generally, I listed to UMass sports on the internet feed of WRNX. I lose the FM signal around Winchester, NH on the way home. I cannot hear WLLH's AM signal despite the fact I'm not that far away in southern New Hampshire. Utah's center Zane Taylor on voluntary summer workouts. Somebody made up a chart on Syracuse's player losses. The CAA website has a UMass preview article up. Last year's frozen game with Hofstra at McGuirk was a battle not just for the win, but for the title of senior class with most wins. The UMass 2008 seniors ended up going 37-14, taking over the title from the 2006's senior class' total of 36 wins. That's a total of 30-10. The 2009 UMass seniors could win the title of most wins for a senior class by going 8-3 or better this year. Incidentally, 8-3 would probably be a lock for the playoffs, making 2009 even more of a success. The probable loss at Kansas State means the Minutemen would have to achieve 8-2 against the rest of the schedule. Remember yesterday's post that we will be playing UConn on 08/30/12? Well, I hope UMass AD John McCutcheon has a very large buyout provision in that contract. It looks like Northeasten's opener next year against UConn will be moved to Oct 9th because UConn added Michigan to its schedule. If Northeastern didn't have an open date, they would have been in trouble. Dave Coulson in his "Around FCS" column previews the CAA ---- and predicts a second place finish in the CAA North for UMass. The Frederick News-Post says ex-UMass Coach Don Brown is changing the culture of Maryland's defense. Maryland's ex-DC Chris Cosh? Why he's now co-defensive coordinator at Kansas State. Speaking of Kansas State, they've had some injuries in training camp. The Sun Sentinel has a video interview with Brandon London here. First off, Happy Birthday to UMass QB Kyle Havens! He turns 21 today. Havens told a good story at the UMass Media Day yesterday. He's a California guy. When he left to report to UMass this January, he got on the airplane in San Francisco and it was 70 degrees. He gets off in New England and it's around zero----and he's wearing shorts and a tee shirt. The UMass Athletic Dept website has a transcript of Coach Morris' replies to questions here. The site also has a image gallery. The Boston Herald has a media day story here. The Worcester Telegram has an article about UMass LB Eric Dickson here. The Hampshire Gazette has an article on the QB competition. Interesting that Kyle Havens has a redshirt year to give. I didn't know that. Matt Vautour also has a blog note about Havens. Not much new information out of the event. Still no decision on QB. Coach Morris said he won't platoon QB's. He said we were strictly a pro-set offense, which seems to preclude having a QB run a series or two from the spread. I only saw on player on crutches, so it looks like we're healthy so far. Thanks to UMass SID Jason Yellin for allowing me to attend. Thanks to Josh Maurer for making a point of saying "Hi". No report from practice. After waiting three hours, I was asked to leave as Coach Morris was closing the practice. I'll have a image gallery up myself, probably this evening. I-originally-started-blogging-about-Syracuse-because-of-the-UMass-connection-but-now-it's-getting-really-weird-dept. Another player quit the Orange yesterday. This post on the Courant.com says UMass will play UConn at their stadium on 08/30/2012. Former UMass OLB Matt Dawson has been added to the New Hampshire coaching staff (scroll down). Dawson is also mentioned in this article by the Concord Monitor. UMass will induct six people into the UMass Athletic hall-of-fame in October of this year. The Springfield Republican has an article here .Two of the honorees have football connections. Joe McLaughlin was First Team All-conference in 1977 and 1978. I've done a couple of blog posts that have some information about Joe. Bob Marcum hired Mark Whipple. Even more important, his decision to fully fund UMass football scholarships led to the most successful era in UMass football history. He was also a professional AD and that was a big step up for UMass. Previously, the AD position was used as a political sinecure. A Tale of Two States: while Massachusetts is in a perpetual meltdown, Virginia is funding a 62 Million upgrade to James Madison's stadium. Bring on the Cats breaks down the QB position for Kansas State. UMass FR Thad McCummings gets a mention in this article from the Metro West. The Baltimore Sun has some quotes from Matt Lawrence. Another new UMass Fan Blog. Minuteman Athletics will be covering the full range of UMass sports. May it prosper and have many, many blog posts. I've added a link in the sidebar. Fear the Triangle part II. For some reason, I totally missed Fear the Triangle would be authored by "Rocks22". Rocks is both sane and knowledgeable ---- a rare combination on message boards. He'll do an excellent job with the blog. I'd like to see some articles explaining the game. What is "offsides" in hockey anyway? Somewhere at UMass Mike Mele is smiling. You will remember new UMass LB Mike Mele transferred from Syracuse after apparently losing his position to JUCO Derek Hines. This blog post has the details and, as I read the quotes, Syracuse coach Doug Merrone said the Orange would be able to win with Hines. Jeff Thomas has an article about UMass defensive coordinator Keith Dudzinski. Every TV game I saw during the Brown era the announcers said "Well, Dudzinski is the defensive coordinator, but Coach Brown really runs the UMass defense". Well this year Dudzinski has a chance to show what he can do. Good luck Coach Dudz! More on the good showing Matt Lawrence made at the Ravens-Redskins game. UMass Band to break ground on new facility at Homecoming 2009! One of the vast army of UMass Blog reporters sent me a copy of George Park's latest news on the the UMass Marching Band's new facility. Congrats to the Power and Class of New England! Dear Friends, Alumni and Members of the Minuteman Marching Band. It has been far too long since I have been in contact with you. (Although, for many, I am sure you welcomed the silence, particularly after last years deluge of requests). However, many have been wondering about the status of our potential new band building. Well we finally have some news. AND, IT IS GREAT NEWS. A few weeks ago, Chancellor Holub and his executive committee approved new revised plans for the new Band Building! A lot has changed since our last communication about the building. We have worked very hard during this past semester, and I am very excited about the work that has been done. The new building will be built closer to the center of campus. In the new facility we will keep Grinnell, and build the new building adjacent to it. Combining Grinnell with the new facilities will finally give the Minuteman Band a great home that we all can be very proud of. Of course, we could not have done this without the love and dedication of so many Band Alumni and loyal friends and fans. In order to thank our friends and alumni, we are planning a GROUND BREAKING CEREMONY for HOMECOMING DAY, 2009!!! Yes, October 17, 2009 at 1:00 p.m. followed by the Homecoming Football Game at 3:30. We hope you can consider joining us for that historic day. Let us make this the most memorable ground breaking ceremony ever! It will be the only ground breaking on this campus that has occurred with a full 380 member band providing the live music! With over 650 people on the Wall of Power and Class, I can only imagine that this could be the largest ground breaking ceremony we have seen! " New to the UMass Blog scene is "Fear the Triangle" a UMass Hockey blog. May it prosper and last a lot longer than the previous Hockey Blog. I've added a link in the sidebar. CBS3 will air a UMass Season Football Preview on Sept 4th at 8:00 pm. Speaking of Kansas State, Rival.com has them ranked #89 behind Buffalo and Iowa State. I don't think so. Good News! Eastern Washington got their marching band back! Watched the Jets-Rams game last night. James Ihedigbo had some close-ups. He wiffed on Ram RB Sam Gato's 77 yard TD run. Matt Lawrence gets several mentions in this article from the previous night's Ravens-Redskins. Quote "Lawrence (36 yards, nine rushes; 38 yards, three catches) continued his breakout night by converting a third-and-5 play into a catch-and-run and a first down at the 16." Over on the very good Boston College Eagles blog "Eagle in Atlanta", I found this link to a Globe article on some of the top recruiting prospects for 2010 from Massachusetts. Former UMass All-American OL Alex Miller is now a graduate assistant coach with the University of Oregon Ducks. If you haven't seen UMass' first-day-of-training-camp video, it's on YouTube. Video includes Kyle Harrington's second best ever bench press of 475 pds and Vincent Westcarr's record freshman lift. Former DL John Hatchell still owns the UMass record lift of 525 pds. Article from the Manchester Examiner on Tony Nelson. Article from the Manchester Examiner on Scott Woodward. Adam Nettina of "In the Bleachers" has an article on his preseason FCS Top Ten. He also sends along his congrats to Jeromy Miles for being named a UMass captain. This article from the Bleacher Report talks about the circumstances of Brandon London's being cut by the Giants last year. James Ihedigbo gets a mention in this article. The Jets and the Rams play tonight at the Meadowlands. Check your cable or satellite listings to see if the game is available. I meant to mention that the UMass Football Blog blew through 500,000 page views earlier this week. I'm still looking to give away a very nice UMass Football Blog hat to the person who e-mails me the closest guess to the UMass-Kansas State game. E-mail access is in the "About me" section of the blog. Mark Whipple talks about the pressures of coaching. Nice story from the Syracuse Post-Standard about Rhode Island RB Joe Casey. He suffered a compound fracture of his leg last season. With Casey out, the Ram were 11th in the CAA and 114th in the nation in rushing offense. Rhody averaged 2.2 yards/rush for 68.5 yards/game. You will remember the only game UMass' defense looked like the 2006 version was the game at Kingston. With no running threat the UMass defense teed off and had a season high 8 sacks for 55 yards. Kansas State's best receiver may be 5-7 Brandon Banks (1,049 yards and 9TD's). Brandon London gets a quote and a picture in this article. As usual, Matty Vautour has perhaps the most informative article to come out of training camp so far here. The quarterback position seems to be a two-man contest between Kyle Havens and Scott Woodward. I would expect the decision to be made pretty quick. Other news from the article is that senior LB Josh Jennings is still not practicing due to a chronic back injury. Jennings was CAA co-Defensive player-of-the-week three times (8/31,10/3,113) in 2008. If he is unable to go, then all three LB positions will have new starters this year. Matty reports that UMass adds another transfer 5-11 212 pd LB Dawon Nolton from New Mexico State. Nolton's 2007 Scout.com page here. Matty follows up with an article about the 2009 UMass linebacking corps. Reading between the lines, it does not sound all that good for Josh Jennings. Mentioned are Kurt Filler, Tyler Holmes, Mile Mele (and I would guess that those will be the starting three), as well as Nolton, true freshman Devin Lindsey and senior Eric Dickson. Kyle Harrington won the bench press competition with 475 pds. Freshman Vincent Westcarr set a UMass freshman record with 435 pds. Eastern Washington has dropped its Marching Band due to financial problems. Bummer! The New Hampshire Football Report says New Hampshire will play Big Ten team Minnesota in 2012. Dave Coulson of The Sports Network previews the Patriot League and picks Holy Cross the winner. A first round playoff game between the Crusaders and UMass would be the biggest cross state game in years for Massachusetts. UPDATE: Memo to UMass coaches. Three more Syracuse players are available. Former starting fullback Dan Collier, DE's Zary Stewart and Romale Tucker. Bump. I'm giving away a very nice "UMass Football Blog" hat free to the person that sends me an e-mail with the closest guess to the score of the UMass-Kansas State game. It's purely for fun and there are no commercial implications. Response so far has been light, so make a decent guess and have a good chance of winning the hat. My e-mail address is available in the "About me' section of the Blog. Congratulations to Valdimir Ducasse and Jeromy Miles who have been named the 2009 UMass Football captains. Ducasse is a UMass success story. He's a Haitian immigrant who arrived at UMass and was pretty raw in his football skills. Now he's in line to be the first UMass NFL Draft pick in some time. Jeromy Miles led all CAA defensive back in tackles in 2008. He was first in tackles in the UMass defense with 108. A strong senior season could get Miles a NFL slot also. 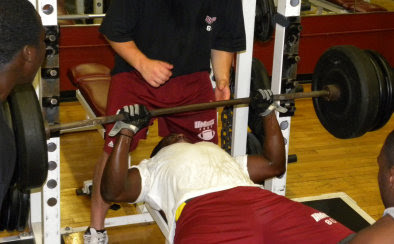 From the UMass website"UMass will have its strongest team ever as a school-record 10 players bench pressed 400-plus pounds in Monday's testing" I do a little powerlifting myself and I have to admit, I've yet to put up 400 pounds. A four hundred pounds raw lift (without a bench press shirt) is really good no matter what your body weight. Congrats to all UMass players for their hard work off season. Photo gallery from the first day of practice here. Jeff Thomas has story on training camp covering the QB situation and more here. Chuck Burton has a new column about the start of the FCS season. One note: Appalachian State passed on accepting former Michigan QB Justin Feagan. The Washington Times talks about Don Brown's blitz-happy days at UMass. Brandon London gets a mention in this article. Since London is a Dolphin, in a spirit of solidarity, I asked Mrs Blog if I could get the Miami Dolphins cheerleader's Swimsuit Calendar. She was not enthusiastic. 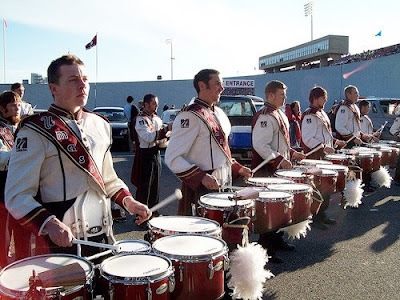 Just to get you goin', the UMass Drumline plays a six-minute Stevie Wonder Medley in 2008. Turn your speakers all the way up! More on the UMass Drumline here. The Springfield Republican has a story and video of Thomas Jones and James Ihedigbo mixing it up at the Jets training camp. Another story about Don Brown's re-working of the Maryland defense. A site with TV and internet listings for FCS football games. Matt Marcorelle may be the Delaware Hens best defensive player. He's being moved from DE to linebacker. On Saturday I blogged a link about Appalachian State's star QB Armanti Edwards tangling with a lawn mower. He ended up with 30+ stiches. Ever wonder how Mike Leach of Texas Tech keeps producing quarterbacks that throw for 4,000 yards a season? Smart Football has a report on Texas Tech QB drills and how the Red Raiders get an amazin' amount of repetitions in their practices. Matty Vautour says a "New era dawns for Coach Morris and UMass Football"
The Manchester Examiner says the return to glory "Won't be easy for the Minutemen". UMass is interested in 6-7 270 pd OT Aaron Kramer from Duxbury, MA. Kramer's ESPN recruiting page here. The Wicker Local Natick paper has some information about this year's recruits Tim Bryant and Tom Bryant. Lots of UMass mentions in this article about former UMass HC Mark Whipple. The word for Kansas State this year is uncertainty. In case you missed it Armanti Edwards of Appalachian State tangled with a lawn mower and will be out 2-4 weeks. He had already been on reduced training most of the spring due to shoulder surgery. Former Michigan QB Justin Feagan may be transferring to ASU. In CAA news, Towson who everybody is picking for the CAA cellar, just lost their leading rusher. Former Texas Tech WR Michael Crabtree, who we met last year, is holding out on the SF 49ers. The on-again off-again NCAA ban on post season games for Delaware teams is on-again. If Delaware is indeed banned from hosting FCS playoff games, it will make a huge impact in the CAA and in the national FCS/I-AA playoffs. Speaking of the CAA the Daily New Online discusses how strong the CAA has been recently. 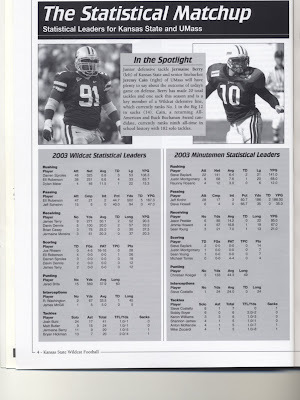 Presented here are three scans from UMass-Kansas State game program of September 13,2003. Click on the image and Blogger displays a larger view. In 2003 UMass went 10-3 with losses to the Wildcats and triple-overtime thriller to Delaware. We then lost in the first round of the playoffs in the Colgate Snow Bowl. The Minutemen were, for the 19th time, A10 Champions that year. This was one of Whipple's best teams. The Captains were Jeremy Cain, Jeff Krohn and Anton Mckenzie. On offense there were such names as Jason Peebler, R.J. Cobbs, Jimmie Howard, Rob Kane, Colin Stoetzel and David Thompson. On defense there were, beside the two captains, Shannon James,Valdamar Brower, Serge Tikum, L.A. Love, Steve Costello and more. For K-State the big name was Darren Sproles. UPDATE: Article published today says Sproles may be the NFL's toughest player. UMass led after the first quarter 7-0 after Jason Peebler's 65-yard bomb from Jeff Krohn. The rest of the game was all Wildcats as they outgained us 490 to 191 yards. Sproles rushed 28 times for 152 yards and 3TDs. The UMass defense held K-State to a season low 38 points and forced four turnovers. The Cats had 46,102 fans at the game. Bump. I'm giving away a really nice "UMass Football Blog" ball cap to the person that e-mails me the closest score of the UMass-Kansas State game. My e-mail address is in the "About me" section of the Blog. One month to K-State game! Special thanks to the CAA Media Office and Scott Meyer for sending me the 2009 CAA Media Guide. I spent most of yesterday afternoon reading it. Big Y Supermarket • Hadley, Mass. Head Coach Kevin Morris and members of the UMass Football team will be at the Big Y in Hadley this Saturday, Aug. 8 at 12 Noon to raise awareness about the Juvenile Diabetes Research Foundation. Coach Morris, who is a spokesperson for the cause will be on hand to meet and greet fans and talk to the media about his involvement in the foundation as well as the upcoming football season. Coach Brown gets a mention in this article:" Five burning questions about the ACC Atlantic Division". Chuck Burton reports on the Patriot league Media Day and spends a lot of time talking to former UMass Coach Tom Masella. Alex Hrebec walked on to Kansas State. Now he's defensive captain. Richmond game. It will be our last trip to City Stadium. Vladimir Ducasse is listed as #162 in the latest edition of NFL Draft Scouts "Top 750 2010 Draft Prospects". Link brought to my attention over on the excellent Draft Daddy Blog. Most Big East coaches favor adding a 9th team to the league. The Eagles cut former UMass star Courtney Robinson yesterday. The Sports Network released the last group of Buchanan and Payton Award nominees for 2009. The only player from either new group we will see in the regular season is UNH QB R.J. Tolman. James Madison appears to have signed a Rivals three-star recruit. He's a former Virginia Player-of-the-Year. Don't forget to send me an e-mail predicting the UMass-Kansas State score. 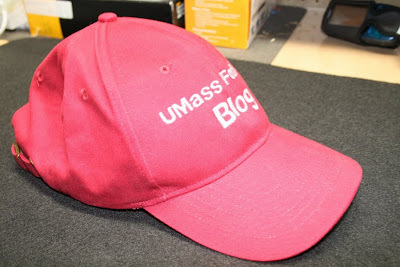 The closest guess to the actual score on Sept 5th wins a very nice "UMass Football Blog" hat. Did Syracuse coach Doug Marrone take a shot at new UMass LB Mike Mele in this story? JUCO LB Derek Hines is listed as the starting WLB for the Orange ------ despite the fact that he has yet to set foot on the Syracuse campus. Donnie Web of the Post-Standard asked Marrone if that was unsettling. Marrone replied ""Not as unsettling as if you're playing with someone you know can't win," said Marrone.". Another mention of Mele and Sheehan in this article. Former UMass WR Brandon London receives mentions here and here in Miami Dolphins training camp. He also mentioned in this Miami Dolphins press release. London's extensive Dolphins bio here. Carson Coffman will likely be the starting QB for the Kansas State Wildcats on Sept 5th. Here's the contest I talked about, but never ran last year. I will give away this cool UMass Football Blog hat to the fan who e-mails me the closest prediction to the UMass-Kansas State score. It's free and I will pay the shipping cost. It's for fun only and your e-mail address and your name will be kept totally private. You don't have to send me your mailing address unless you win. It's a high quality, never been worn hat that has "UMass football Blog" in Arial script block letters. The hat is maroon with white letters. It's one of three in existence. More hat pictures here. Send me an email with your prediction. My e-mail address is available in the "About me" section of the blog. Ties will be settled by date (earliest best). Any other needed decisions will be referred to Mrs. Blog for adjudication. Her decisions are unreviewable, unappealable and final. No e-mails after September 4th will be counted. "They projected us to win the North, which I expected," said Ware. "The only thing that kind of surprised us was that UMass was picked second, because of their performance against us last year and they got a new coach. I don't know if they'll be there." In other UNH news, the next two (and probably last) games in the New Hampshire-Dartmouth series have been moved to 2014 and 2015. 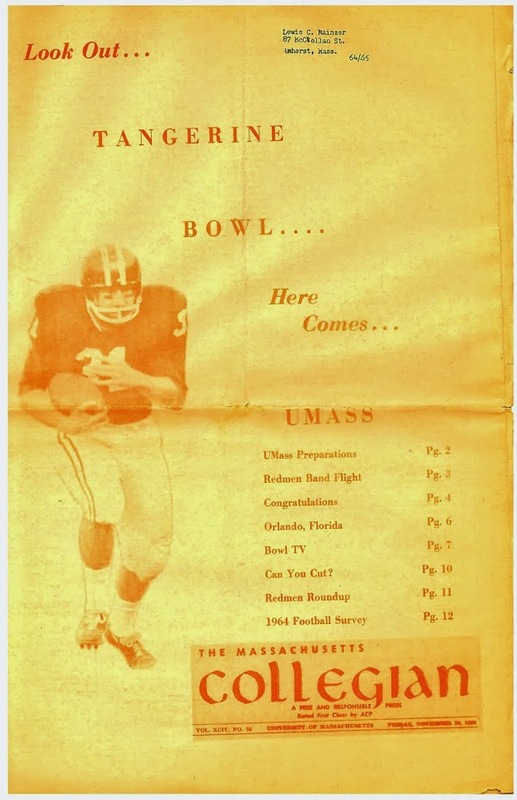 You remember when UMass first announced the contract to play Michigan, it was incorrectly reported that the Minutemen would be the first team to play in the renovated Michigan stadium. That turned out to be false as the Michigan administration wanted a "Special Opponent" for that event. The Wolverines have announced the special opponent is -------- UConn. UMass' Sept 26th opponent Stony Brook has been picked 2nd the Big South preason poll. The Sea Wolves return 19 starters and 40 letter winners. UMass is tied for 15th in the latest College Sporting News consolidated FCS preseason poll. Matty Vautour has an article on the two Syracuse transfers. No new information. James Ihedigbo gets a mention in this NY Post story. Ihedigbo's jets bio here. Former UMass coach Frank Forcucci is now Defensive Coordinator for Northeastern. Former UMass DT Malik Hall joins the Fordham staff under Tom Messala. Former UMass assistant coach Eddie Morrissey has also joined the coaching staf at Fordham. The CAA Media Day video vault has Coach Morris' interview up. Kansas State-UMass tickets are going fast. The return of Bill Synder h as heightened interest in the game. See this article and this article. UMass won't be the only team on the field with a new starter at QB. Yesterday I called 1-800-221-CATS and ordered two tickets for the UMass section.